In principle injection molding consists of high pressure injection of the raw material into a mold which shapes the polymer into the desired shape. Initially, plastic material, usually supplied in granular or powder form by the raw material manufacturer, is fed by gravity from a hopper into a heated barrel with a reciprocating screw. As the raw material is moved forward in the heated barrel by the screw, the granules get mixed, homogenize and melt. Following the plasticizing process, the hot molten plastic material is injected through the axial feed of the screw under high pressure into the mold. 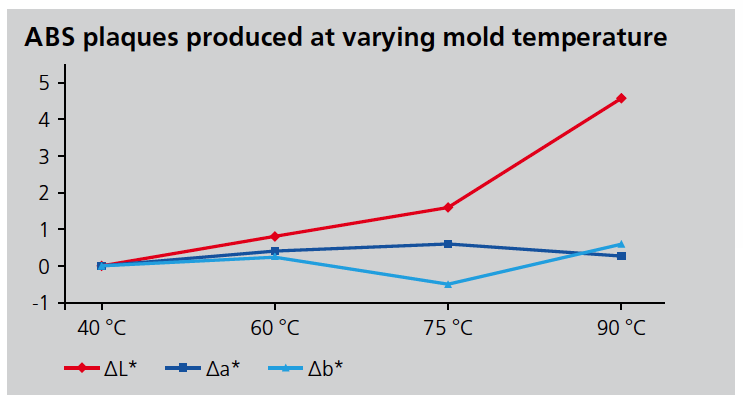 For thermoplastic materials, the melt needs to be cooled in the mold to ensure the necessary dimensional stability. Once the part is sufficiently cool, the mold opens and the part is ejected. The challenge of an economical production is the reduction of cycle time to achieve a higher output. Reduced cycle times can only be achieved by increased production speed, coupled with increased temperature or pressure. Changes to these process parameters, will have a direct impact on color as well as on gloss. Due to the complexity of the production process an objective QC system is needed to guarantee a high quality product at the end. In order to guarantee consistent color and gloss a frequent sampling rate is needed depending on total production rate. As some colors might change depending on temperature (= thermochromism) the measurement should always be performed at temperature of the final product to achieve comparable results. Thermochromism: A temperature-induced and completely reversible change of the absorption behavior of a material in the visible range. Uniformity and consistency of color is percieved as high quality. Many finished products consist of multiple components. Most of the time, the components are manufactured by different suppliers and at different locations. But in the end the assembled product should be uniform in color. Thus, not only the production process needs to be controlled, but also the overall harmony of the finished product. Color tolerances are dependent on the application and the hue. Studies have shown that CIE Lab color space is not uniform. The above diagram shows the CIELab color space divided into an infinite number of ellipsoidal micro-spaces. 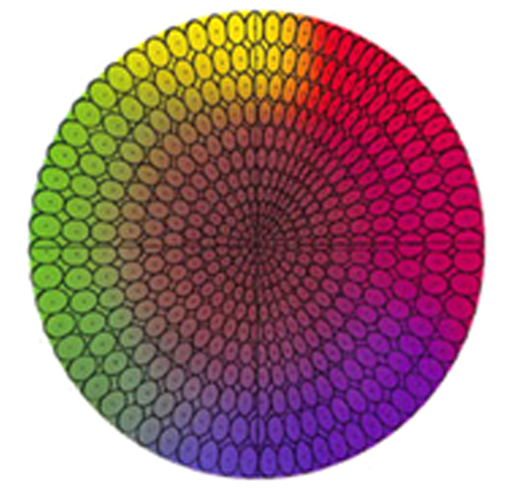 All colors within one ellipse are perceived as the same color. Reason being, a difference in hue is more obvious than a difference in chroma. Tolerances for hue must be tighter. Chromatic colors have larger ellipses than achromatic colors. Therefore, larger tolerances can be used. The size and shape of the ellipses are different dependent on the hue. Thus, tolerances need to be defined by color families. Over the years new color systems and equations (ΔECMC – ΔE94 – ΔE99 – ΔE2000) were developed based on visual comparison studies for solid colors to improve the visual correlation. BYK-Gardner offers complete quality control solutions for your application in plastics. For more information visit BYK.com.